Choosing junior golf clubs for children must focus on the child's size and weight to ensure skill development and enjoyment of the game. 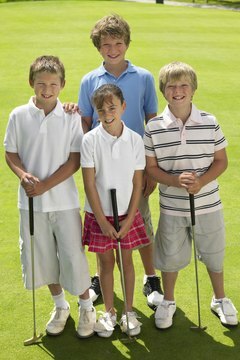 If you're a golf enthusiast, you may yearn to take your kids out on the course with you. As the kids get older, it can make a terrific family day. But with all the gear out there, it can be hard to narrow down the choices to determine what's the best set of clubs for your junior golfers. Focus on what they like. If they like Snoopy, get a beginning set that incorporates that character. Similarly, if they loathe pink, don't buy them a set that incorporates this color. While junior sets are often differentiated as pink for girls and blue for boys, there are some striking orange, red and black sets to consider (see Resources). Measure your child. The most critical component of a set is the length of the shaft. A child who has a set that's far too large won't enjoy the game. The club will be unwieldy and unusable for that child. Clubs come in specific height ranges to provide the best fit. See if there's a swap-out program. Since height is such a critical element, a set that works now may not fit in 12 months. And you don't want to have to pay for a full set every year. Many manufacturers offer a program where you receive either full retail credit or partial credit toward upgrading the clubs to the next size. Test the clubs. Have your child play in the simulator, or see if the store allows a trial period with the clubs. Take her out to play a few holes and see how the clubs play. Your child should be able to stand comfortably without having to hunch over (too short) or choke up on the club (too long). How Do I Choose the Correct Golf Clubs? How Do I Carry a Golf Bag?